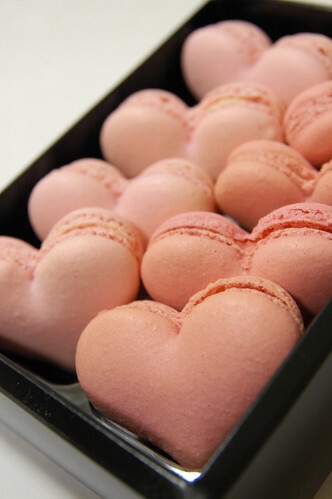 You guys (says the Philadelphia girl), do you like macarons? When I first started to see them pop up around the food blogosphere, I was enraptured. They looked so delicate, so pretty, so amazing, and so delicious. I wanted to make them no matter how long I had to age egg whites on my counter. I wanted to make them so people would look at food I had made and weep with joy at the idea of eating them. However, they seemed to be an exclusively non-United States treat, and I didn't have the money or energy to jet off to France or Australia for some sweets, no matter how cute. Time has moved on and they are now popular here! A few months back, P and I went to dinner with my brother-in-law and sister-in-law and several of their friends to Talula's Table, and the ending bite was a single teeny macaron. It was the first I had ever had. I was afraid I would be disappointed, but that single bite told me everything I needed to know -- macarons were as good as they looked! In fact, when P told me he hadn't loved his, I almost got angry at him for eating it. I could have eaten that bite! That could have been my macaron bite! Did I eat the stupid heirloom tomato salad that I didn't care for and not give it to him? No, I gave him the salad because I loved him. I realize this is not rational, but the macaron was that good. The macarons were excellent. My favorites of the night ended up being the salted caramel, the chocolate, and the huckleberry. The salted caramel seems to be the popular favorite online for the Trading Company, and it was certainly fantastic, but my favorite was the chocolate. The chocolate was fudgey and much like a flourless tart in its intense flavor. I could buy a whole dozen and just go through them. My excuse would be pregnancy! Does anyone else in Philly know of a good place to try more macarons? Alternatively, any online places ship that you'd recommend? Yelp tells me Aux Petits Delices in Wayne, which makes only fab things IMHO, also sells them. I've only had the Miel macarons, but it was a LOOOOONG time ago; back when I was still single and living in Rittenhouse (before Garces took over the city). I preferred their madeleines though, because I was in madeleines kick (I swear, i only bought 3 pans, and I do use them all). I think I am still annoyed at Miel because they never got into making caneles. I refuse to get a canele mold though, too difficult to clean with all the wax and stuff. (I am upset at TJs for stopping to sell them they sold them for about 2 months in 2008...I know they sell them at Headhouse...but too far away!). Miel is due a visit, I can see. Angie, I'm embarrassed to admit I've never had a canele. What makes them great? OMG Jenn! Caneles are amazing, and metropolitan almost always has them. Monday. We get them Monday. Not to worry, caneles only started popping around the US about a year or a year and a half ago, and they're crunchy in the outside, custardy in the inside. Not too sweet, but just perfect to go with coffee. Man, now I wish I was lived close to Rittenhouse once again...didn't realize metropolitan bakery also carried them now! Angie, I had one from metropolitan! I've avoided them forever because I assumed they were bready rather than crispy/custardy. I still think I prefer a lot of other sweets, but I certainly would not turn down one if I saw them at a dessert table. Are they really that hard to make, though?